You've probably seen those Verizon ads on TV by now, showing their 3G map in red and AT&T's 3G map in blue, saying that Verizon has 5X more 3G coverage. We knew AT&T didn't care for this, or for having their iPhone stranded on the Island of Misfit Toys, as they filed legal action for Verizon to alter and remove the ads and even released a Memo on the subject. Now AT&T has taken it a step further with a TV ad shown to compare the two providers. 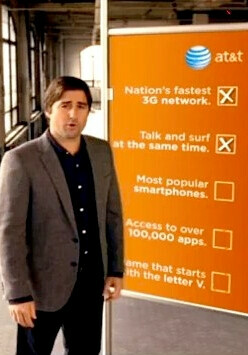 It features actor Luke Wilson saying that AT&T has "the nation's fastest 3G network, talk and surf at the same time, most poplar smartphones, and access to over 100,000 aps" all giving marks to AT&T, then lastly giving one mark to Verizon for "name that starts with the letter V". So what do you think of the new AT&T ad that looks like it was thrown together in under an hour? Maybe all the budget went to Luke Wilson that they couldn't afford better graphics? Let us know in the comment section below! Ha! Yeah not to mention ATT should amend the statement "most popular smartphones" to "smartphone". And also mention that the 100,000 apps only apply to that particular "smartphone". Oh, and then also mention that sure, that smartphone can talk and surf the web, but try multitasking in any 2nd or 3rd party apps, and then tell what's what. As much as I actually like the iPhone, ATT is just digging themselves a bigger hole with this add. And I even like Owen Wilson...when he was in Old School. My bad...I meant to say Luke Wilson. Umm, the iPhone was only referred to once, which was the 100,000 apps thing. And now you're making the whole advertisement iPhone based. This is why the iPhone will not die anytime soon. People are always referring to it, comparing it to something else, criticizing it, worshipping it, bashing it, etc. This is about AT&T vs Verizon and you somehow managed to be all about the iPhone. This really isn't about the phone at all. AT&T probably wouldn't have mentioned the apps part if Verizon hadn't put (or mention i.e. iDon't and DroidDoes) the iPhone in almost all of their latest commercials. True, this is about AT&T vs Verizon. What you fail to understand is that AT&T's only claim to fame is, in fact the Iphone, without it they are obsolete. I bet you have an Iphone, don't you! Put it this way take away AT&T's customer base without the Iphone and they might as well be Cricket. I agree, seems pathetic and sad attempt of ATT who is nervous and doesn't "really" know how to retaliate on this. I think its kind of comical on how useless their points are in this commercial and how juvenile ATT really is. Very weak. They know they do not have much to fight back with so they put this, factless, ad out there. They complain that Verizon's ads do not state the facts yet they throw things like fastest 3G network out there. If they want to have any credibility SHOW ME THE FACTS. Never mind that SHOW THE PEOPLE THE FACTS. I am not going to deny that, in some instances, their network is faster. But I only know that because I am in the industry. Regular people hear this and they will want to know things like "How much faster," "What do you mean talk and web at the same time?" "100,000 apps for what?" At least Verizon's ad actually has substance. "There's a map for that" as opposed to "Here's Luke Wilson for that." Overall, this is really a very harmless attempt to fight back. 1. They have fastest 3G network - in 1/5th the area Verizon has. Too late to bring this one out. 2. They can talk and surf the web at the same time - for those few people that need to do this and might actually get 3G service. 3. They have the most popular smartphones - if all "smartphones" include only the iPhone, if not, you're not popular. Really has a lot to do with their 3G network, doesn't it? 4. They have over 100,000 apps - for the iPhone, if you have another AT&T phone - too bad. Really has a lot to do with their 3G network, doesn't it? I knew AT&T had nothing to really fight back with and this ad just proves it. love the fact that they hired a famous actor. dont get me wrong Verizon has hired actors in the past (james earl jones). But seriously ATT. you couldnt get your message across without hiring a well known actor? if what you say is true you shouldnt need an actor to relay the message. nice try. the only thing what was remotely true was the fact that you can use voice and data simultaneously. VZW also had musicians too such as Gwen Stefani, Akon, and Prince. He's not famous, just noticable. not A-list at all and hasn't had a hit movie since Old School which Vince and Will dominate anyway. Let's go streaking to the AT&T store! A couple of things come to mind here. First, I read on this very site all the time about you VZW folks crying for a device like the BB Bold. Not to mention the Curve prior to its release on your Code Division Multiple Access network that can barely maintain a bluetooth connection with most of its devices. I think sales for both the Bold and Curve did extremely well for ATT. Second, you people have never experience the joy of simultaneous voice and data. Use it all the time, so you people will never be able to appreciate tethering to your laptop while on a conference call on your Touch Pro2 and getting email on the device at the same time. And remember that party the other night? Wait let me send you the picture I took...wait you have to hang up so the picture message can come through-if you have VZW. Ah yes, remember when you had to disconnect your home phone to get on the internet because you couldnt do both? Hmmm, there's a name for that. They called that dial up service. So much for that vaunted 3G network. And for Christmas, dont expect 4G under the tree to be any better. Can you hear me now? Please don't get me wrong here but what in the world do you do with your spare time? "joy of simultaneous voice and data" Joy? If that is what you live for on AT&T then please stay there. I would rather be able to actually just get a call and not drop it. That all-important picture can wait a few minutes. Now the Bold and the Curve did well yes... but just let a spade be a spade and ask "do they really stack up to the 3 million iPhones?" Face it, if it weren't for the best electronic device out there AT&T would be AT&T-Mobile. AT&T has put all of there eggs into the iPhone and have decided to forego all other facets of their business for the almighty "Net-Ads" wins. And as for 4G, where is AT&T's 4G? Oh wait never mind they can't even keep up with their 3G and they are only about to launch 3.5G. So maybe they can launch their 3.5G over their whole 3G network quickly but remember there is not much of a 3G network to cover so that should be pretty easy. And remember all of those licenses Verizon bought earlier this year? If you think the 3G map looks pretty red wait until you see the 4G map by the time it's done. I can just see the commercials now. Want 10 times the 4G coverage of AT&T - there's a map for that - the whole map. So let me summarize your argument that AT&T is so much better - Call and picture message at the same time and the iPhone. There that is it. The entire argument summarized in 11 words. Wow. And it only took Luke Wilson to tell me that. the ad comes off a little WEAK for me, there is nothing compelling in this ad that makes me think that they have any REAL strong points... -FASTEST 3G doesn't mean squat for any customer living in an area where there is no coverage. Even if they had 3G coverage in dense metropolitan areas, I think it makes sense to have good 3G coverage where you normally wouldn't expect to have Wi-Fi or landline DSL too. I would gladly take LARGEST 3G over FASTEST 3G any day! -If its just only on the mobile network, AT&T does win with simultaneous voice and data, but its not impossible with Verizon mobile phones with Wi-Fi, which I'm glad to say they are releasing more and more of. But again it boils down to the network. Its one thing to have SIMULTANEOUS voice and data, it convenient, but to have the MOST RELIABLE voice and data means more to people who depend on their phones. If AT&T could use words like "LARGEST 3G NETWORK" or "MOST RELIABLE" in their ads that would say so much more about their service. T-Mobile has simultaneous voice and data too, and its not great but that really doesn't make AT&T any more competitive. -As for the carrier with most popular "SMARTPHONE" (not plural), iPhone is a really cool phone! iPhone is an awesome phone that got stuck into a exclusivity agreement. Despite Verizon having the image of crippling phones in the past, their smartphone selection now and going forward is turning out to be the best. You got the Blackberries, Windows Mo 6.5, Droids, and next year we will see the Palms come back! All the major smartphone players are either on Verizon or going to be, and with LTE coming to Verizon first, we'll see who Apple picks next for their AMAZING new product launch. -100,000 apps?!! Really?! I wonder how AT&T can throw a number like that out there on an App Store that doesn't even belong to them. If any other carrier gets the iPhone, those apps are going with the phone not the carrier. This is a cheap temporary advantage that AT&T will ride out till their imminent failure with LTE. -A name that starts with a "V"? Wow even I could've thought of a better comeback! How about countering Verizon's ads with: "Got iPhone enV?" or how about "We call them the BIG RED for a different reason" or "Verizon is Red, AT&T is Blue, can you guess who's mad at who?" C'mon AT&T! Again either way, AT&T that was a very weak commercial. Tell me something your customers already don't know! I was thinking of all these problems when I was reading the article. When it said they had 100,000 apps I started laughing and said to myself "no apple has 100,000 apps". AT&T should also worry about T-Mo becuse sooner or later they are gonna cach up to AT&T and AT&T will b taken buy supprise lol thats what i think. good try on getting Verizon back haha lame as comersial i have ever seen. i just remembered AT&T is the only one with out Android phones. its obvius that there still depending on the iPhone. iPhone is so 2007-2008 the "in thing" now are Androids lol. I didn't see a map at all! it was about their 3g map right? I can sum up their commercial in 1 word.... FAIL!!! No 2 words. EPIC FAIL!!!!! yeah pretty much. considering the map that they were showing wasnt even their 3g coverage area map. They showed a map of there whole calling area. Why do you think "Onstar" chose Verizon? I'll tell you, because their business depends on a RELIABLE network. http://www.wired.com/gadgetlab/2009/07/3g-speed-test So much for that "fastest 3g" claim, ay AT&T? Damn, without that you are pretty much in the business of, well, selling ipods that on occasion my transmit some messages over space. fantastic man!!!! hahahahahah hilarious. youre absolutely right. i never thought about that. (+) for you!